Despite AR and VR headsets being an attractive display option for many companies, some are more interested in an inclusive offerings rather than the single experience headset variant. Denmark-based Realfiction has created DeepFrame, a 64-inch screen that operates the same way as such a headset. DeepFrame is a revolutionary mixed-reality (MR) display that blends the physical and digital elements in real-time. It allows spectators to collectively experience lifelike animations in any size and at any distance without the use of special glasses. 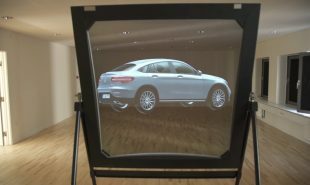 DeepFrame is capable of projecting large-scale holograms thanks to a curved video screen that deflects interactive 3D images in 4K resolution onto a glass optic. This magnifies the image giving the illusion of three dimensions rather than just two. The technology could be used in a number of applications such as museums, amusement parks and retail outlets. We have seen how virtual reality has been adopted in a multitude of ways, such as a performance piece incorporating dance and VR to create a unique display, or being used to honour the dead. How could you use MR in your business? The post Display screen offers alternative to augmented reality headset appeared first on Springwise.